We stand for feminism, safety and more importantly, we stand for safety for women. The latest news about the #WEcount promotes that, and you can read all about it in their press release below. Cheil London takes #WEcount nationwide and takes its message to the streets through new Blippar digital innovation. 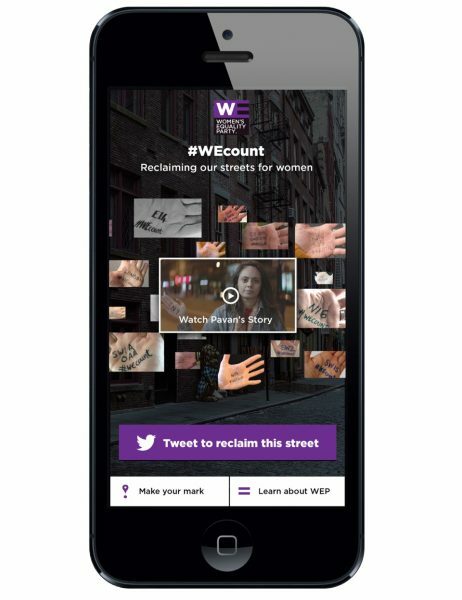 26 April 2016: Cheil London has kickstarted a national campaign for the Women’s Equality Party’s #WEcount initiative, while launching a digital first to bring the campaign to life on the streets of London with Blippar. The #WEcount campaign was launched to allow people to speak out against sexual violence and harassment in London and to reclaim the city for women through an interactive map and social campaign. Due to the success of the campaign, the initiative has now been rolled out across the UK, while a dedicated digital billboard in London also raises awareness of the campaign. Women can mark their experiences on an interactive map of the UK (wemap.org) by dropping a Google-maps-style pin. In London, this map will be on display for the week on a dedicated billboard at Westfield shopping centre, Shepherd’s Bush. In a digital first, Cheil London also has partnered with visual browsing app Blippar to bring the digital campaign to life for Londoners using physical markers around the city. The agency has painted 10 icons around the capital, from the Houses of Parliament to Parliament Hill, which show the Google Maps pin transformed into an exclamation mark. People who blipp the mark will receive a host of content and information about the campaign and incidents connected to the area, raising further awareness of the crimes, available support, and of victims’ stories. Next story Virtual Reality Start-Up? HTC got your back!